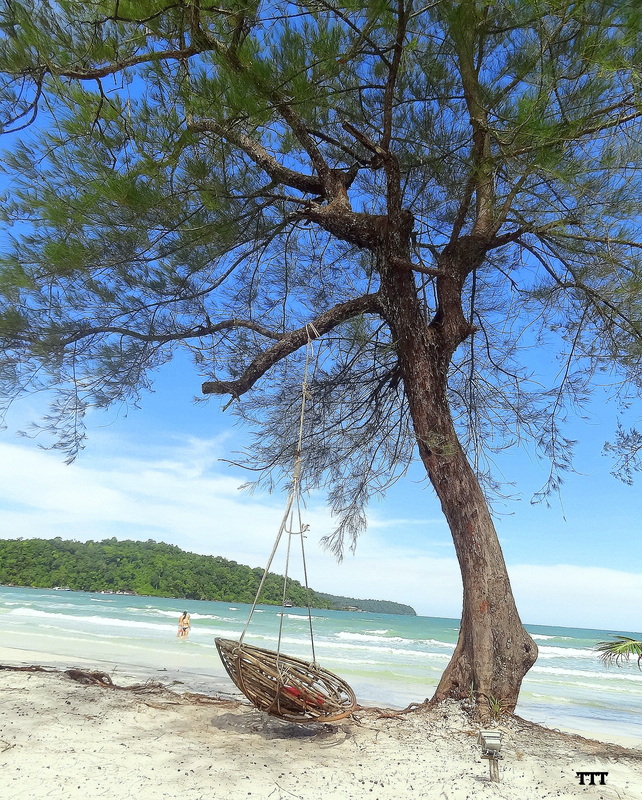 I decided to go to Koh Rong after looking to all the beautiful pictures of the island, thinking that Photoshop or Instagram are magicians which can make things much more splendid than they really are. Pretty sure that you cannot agree with me more 😉 However, Photoshop and Instagram do not need in this case. I was numb when the boat got the island – the sightseeing is so beautiful. We stayed at a relatively far away hotel from the main wharf, thus, needed a boat to transport us to the spot. By walking, it would take us around 20 mins walking along the beach, then to the path, up and down around the mountain. People from the hotel were really nice and helpful. They did not mind to drive the boat to catch the big one, just to let us find some stuff we left there. The island is so remote that electricity is not always available, normally from 3pm to 6pm. Air conditioners are considered as luxury. In here, you have no way but to enjoy the wind blowing from the sea, bring the smell of salt and the sound of ocean. It is perfect to sit down for the meditation to calm your mind from the busy daily life in the normal world, or to read your favorite book to refresh your mind. We walked across the island to the other side to see the sunset. We walked across a tropical forest with big trees and brushed. We saw birds flying in the sky. We heard monkey and maybe some other animals. We passed by a creeping foxtail field in the light of late afternoon. We saw the sun going down at the horizon, reflecting its light to the ocean surface. The nature is magnificent. People, from residents to tourists, in the island are really nice. We found here westerner style foods in open space and open to nature restaurants. I did not experience any extreme people or group of people in my stay. All are likely here for the inner peace of their mind. At the end of the day, we are part of nature, and it is the nature that we seek in the stressful time. I need to venture there one day..